With clam season upon us here in the Pacific Northwest, there is more than a little pressure to get rid of the clams that I hoarded through the summer. When frozen properly in water, these suckers can take up a considerable amount of room in the freezer. As summer wears on and freezer space becomes more of a commodity, there comes a dawning realization that you really need to start cooking some clam-involved dishes. Clam chowder is the standby, but one can not live on clams chowder alone…and if you did, you would either be the size of a walrus or simply dead. It isn’t exactly low calorie or low fat. When preparing such dishes, I have hear whispers in the dark recesses of my brain reminding that heart disease is still the number one killer the United States. This seafood curry is my attempt to incorporate clams into a tasty, yet reasonably heart-healthy main dish. Heck, there isn’t even any coconut milk in it. The formulation is somewhat Thai is style but probably pulls in more variety in fish than would be considered common. 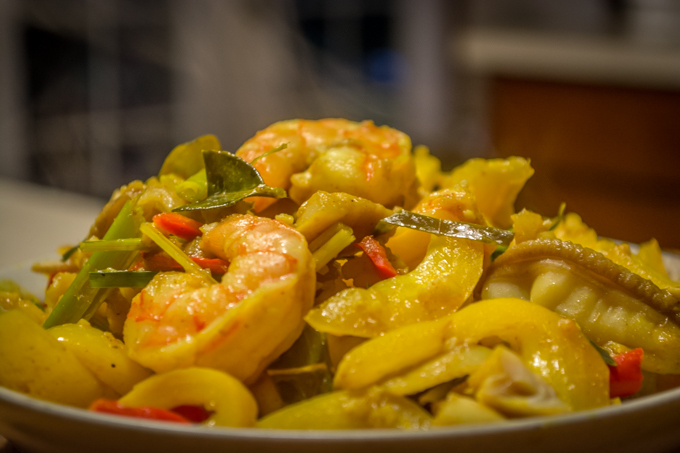 The yellow curry is slightly more mild and a bit sweeter than its green or red cousins and lines up well with the clams, which are also quite sweet. Fragrant notes are provided by the lemon grass and kaffir lime leaves. Turmeric and a bit of garlic provide some additional depth. This dish cooks up really quickly, so it is important to have everything ready to go before you apply heat. Its worth noting that, because the meats (seafoods) cook very quickly, you need to build the sauce first. This is a little unusual and breaks from the common wisdom of adding the fish sauce last as a seasoning; much like soy sauce. Large clams, like razors, can become very tough if cooked too long. Put the cod in slightly ahead of the shrimp and clams, wait until it starts to turn opaque prior to continuing. Add the clams and shrimp and cook until the pink have lost their translucent nature and started to turn pink. Remove it from heat and serve. Using the shrimp as a gauge for how long to cook the clams works quite well and will help avoid ending up with a rubbery mess. 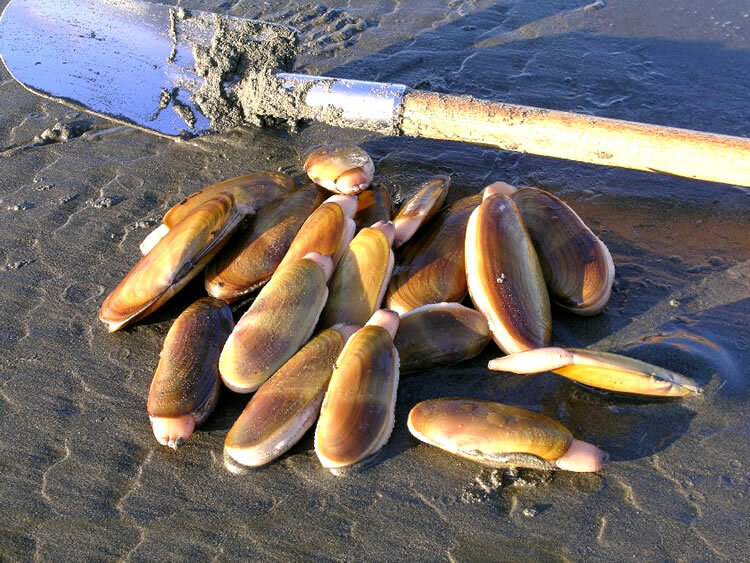 For those of you that do not live in the Pacific Northwest, razor clams are these huge, semi-migratory clams that live on the open Pacific Coast. If you grew up in this region, it is quite possible that you harbor a deep resentment to this particular mollusk. A resentment born out of dark fall and winter mornings spent dying from exposure on storm-swept beaches while pursuing said clams. Truth be told, they really are worth the effort. Just be aware that sun-speckled photos like the ones produced by Washington State Department of Fish and Wildlife (to the left) do not represent the reality of the situation. The left coast is particularly inhospitable from now until about…..July. 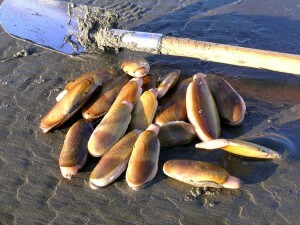 Razor clams are large, meaty, slightly sweet, and produce some of the best flavored chowders that I have encountered. Of course, it is always better if someone else catches them, since they can cut you up quite badly….and they are surprisingly fast for a clam. I know that the Atlantic Coast harbors a similar species, but I can’t vouch for the flavor. For this particular dish I would try to substitute any large format clam (like geoduck) although squid might work as long as you took care with to cross score it and limit the cooking time. Heat 2 tbs. oil in a medium wok and brown garlic over high heat. Add curry and fry until fragrant. Add chicken stock and sugar, stir to combine. Add Fish sauce, lemon grass, lime leaves, chili, and turmeric. Cook over medium high heat for about 1 to 2 minutes to combine flavors. Add clams, shrimp, and cod and cook until just cooked (pieces will become opaque).